I consider myself a LEGO purist. I do not cut parts, paint them, and I do very little with custom stickers. But I confess, I’m bending my purist tendencies as of late with all the great custom tire options available. 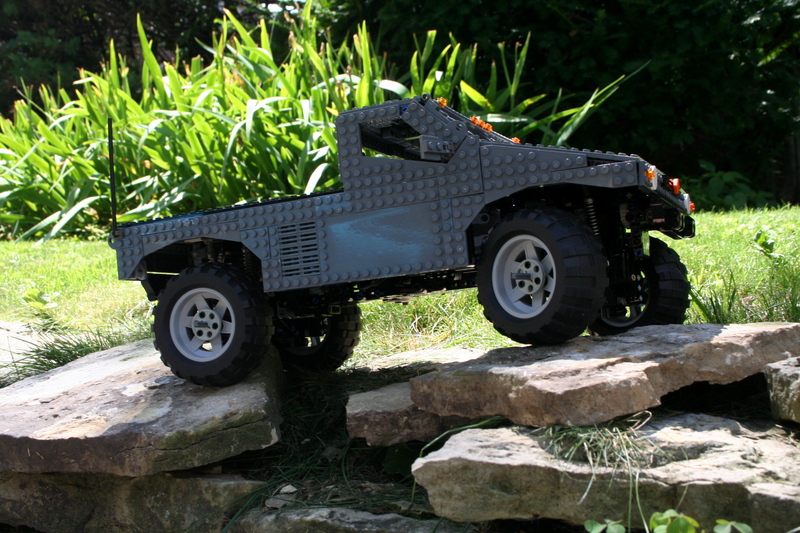 After getting these RC4WD tires, it was time to build another trial truck. The full gallery may be found on Flickr. 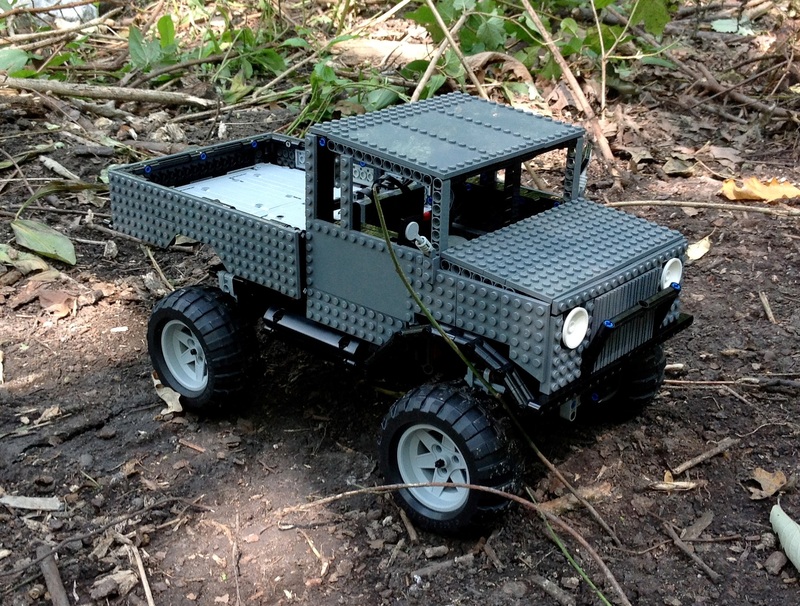 When I build a trial truck, start with three questions: What functions will it have, how many Power Functions receivers will that require, and how many battery boxes will be needed in what placement. Using these decisions I draw up a basic sketch of Power Functions part placement, and I get to work. This truck would have steering, a 2x PF L motor drive, and a two speed transmission. 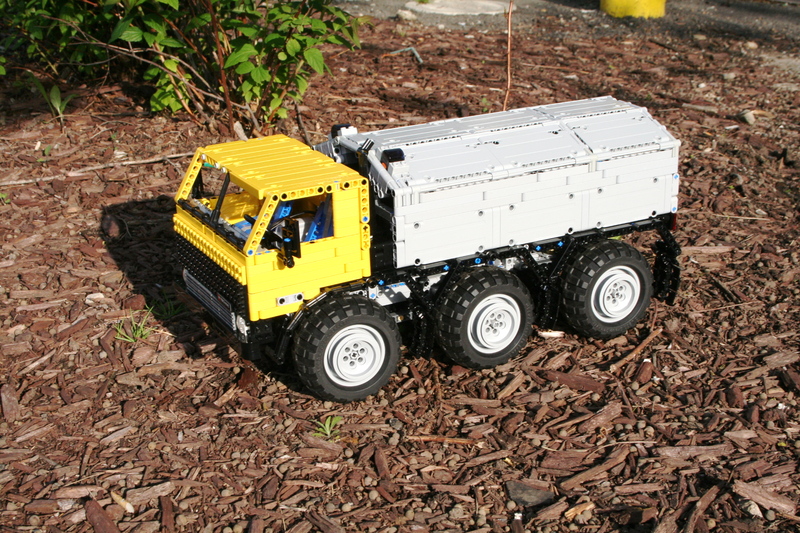 As with other trucks I make, I started with the axles first. The axles were simple as they required no additional functions. Both front and rear have a knob gear in then center, then a 12t to 20t reduction, and a final 8t to 24t reduction in a portal axle setup. 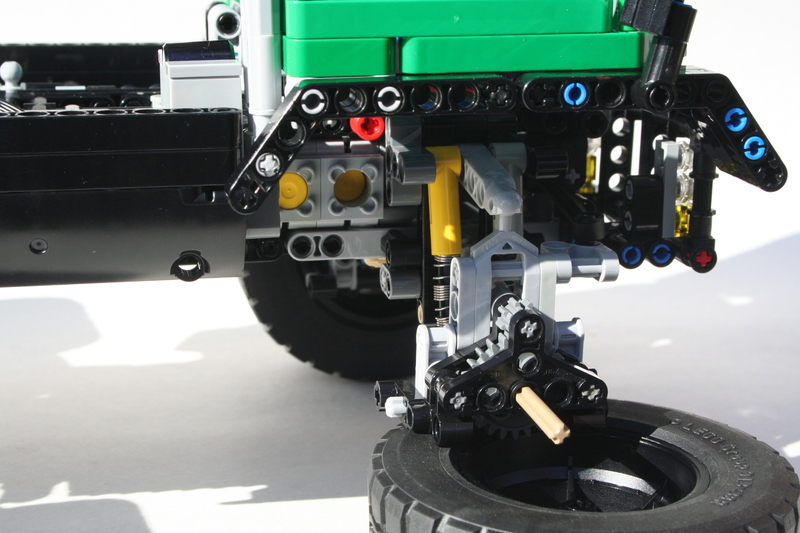 The front as a simple steering setup, and the steering universal joints between the first and second gear reduction. 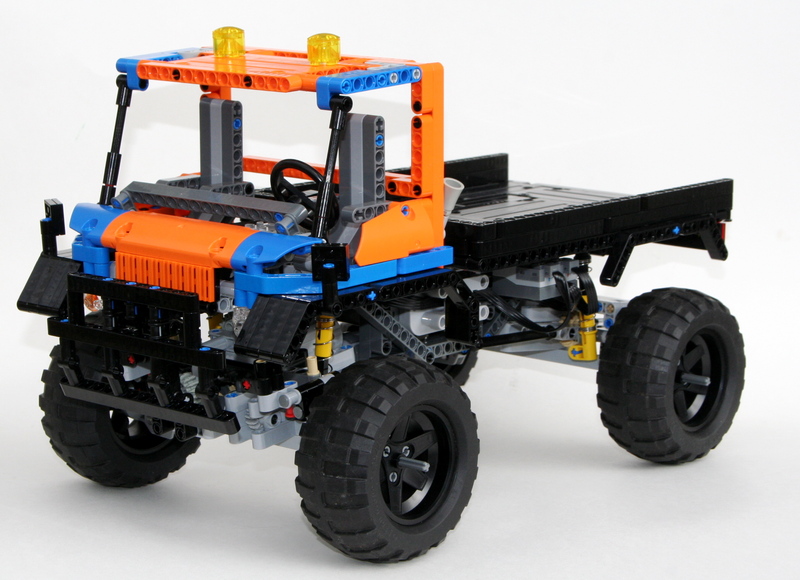 Both axles are strung together with a frame that houses the suspension and electronics. 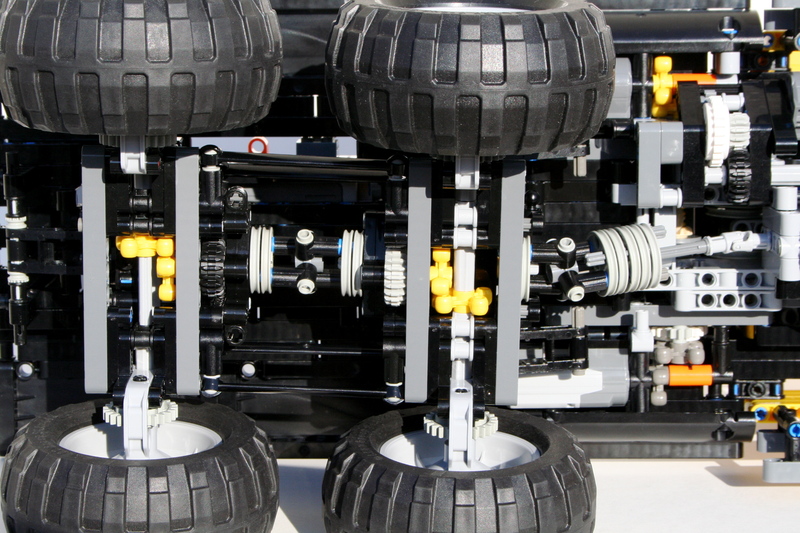 Both axles have pendular suspension, and are linked together with liftarms front to rear. It is a system that is simple, and incredibly effective. A PF M motor is placed in the front to power the steering, and another M motor sits beside it to power the transmission. Two PF IR receivers and two rechargeable battery boxes are placed with one on each side of the chassis. Both PF L motors are mounted side by side in sliding housing in the rear of the chassis. Each motor drives a set of 12t and 16t gear. These separate axles combine to either a 20t or 24t center mounted gear. When both engines are connected 12t to 24t gear, an overall 10:1 ratio is achieved. When both engines are connected to the 16t to 20t gear, an overall 1:6.25 ratio is achieved. With the power of the L motors, this gives a good low ration, and an appropriate high ratio. As this was a quicker build, I did not spend too much time on the bodywork. A simple flat bed was installed, and the cab is sparse. I selected a simple America style cab from this design idea to build in blue. The grille is big and square, and the rest of the cab generally follows the idea. Both the cab and the bed can be simple removed. The truck has plenty of power, and the transmission worked without error. The steering was easily controllable. The larger tires gripped very well, as they are soft with big knobs. 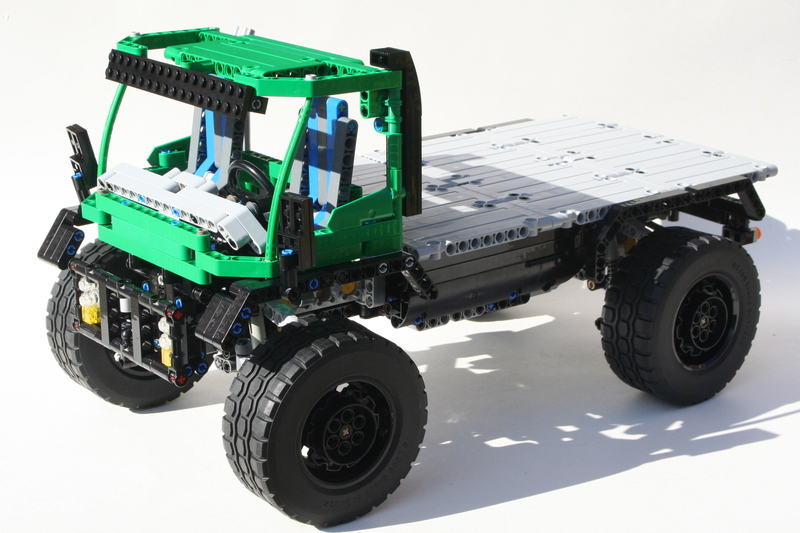 They were a little taller than LEGO’s tires, and combined with the softer sidewalls, made the truck a little less secure in its footing. But the truck did not roll over easily, and the soft tires made it grip the ground well. I will be using these tires again. Until the next MOC, happy building. 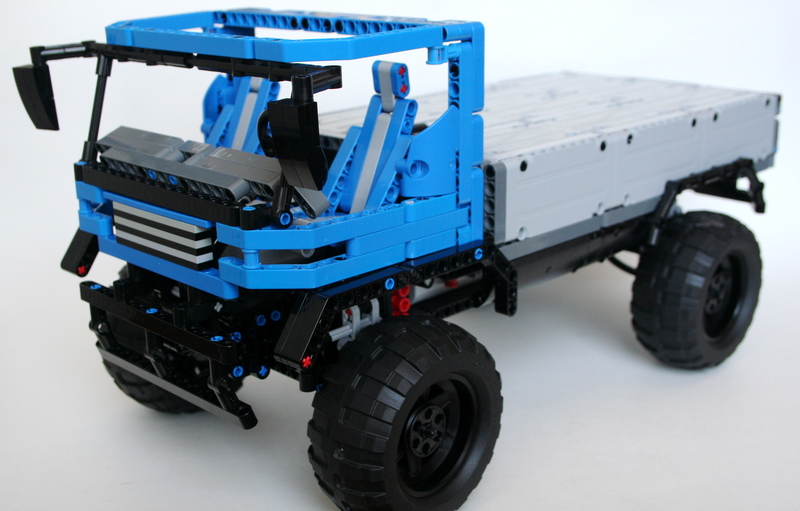 I have said it before, but my favorite things to build are Trial Trucks. 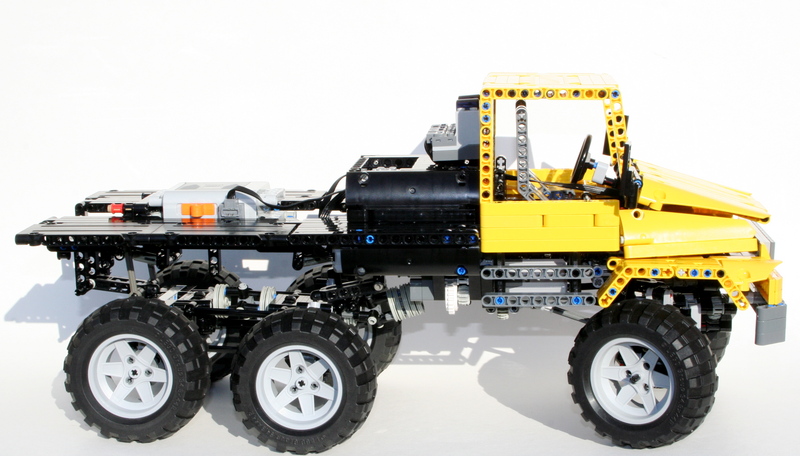 The combination of the driveline construction, forces on the truck, diversity of body style, and various propulsion systems offered by LEGO combine for a great building experience. Because of this, I usually am building a Trial Truck, or have one built at all times. But for some reason, this truck seemed to sit for a long time unfinished. I struggle with deciding if a truck will be a model of something, or something fictional. This decision is often made too late in the construction process. After toying with a Daimler Scout body, I decided I needed to finish this project and the Bedford MWD body was chosen. The full gallery may be seen here. After some some experience with various designs, I decided to construct a truck around a simple locking differential idea I had recently designed. Because I would need an extra IR Receiver for the locking function, I decided a simple two speed gearbox (1:6 and 1:10) could use the other IR channel. I placed all the controls in the middle of the chassis. The driveline and the steering axle would run through the middle. On the left side was the Battery Box and the motor for the gear change, and on the right side was the XL drive motor, the gear box, and the motor for the locking differential mechanism. The steering motor would hang out the back of the chassis over the rear pendular suspension unit. Both axle were connected by my favorite linked suspension system. Each axle took a little bit of work. I selected a simple design for the locking differential. Basically, it is a 24 tooth differential placed directly next to a 24 tooth gear. 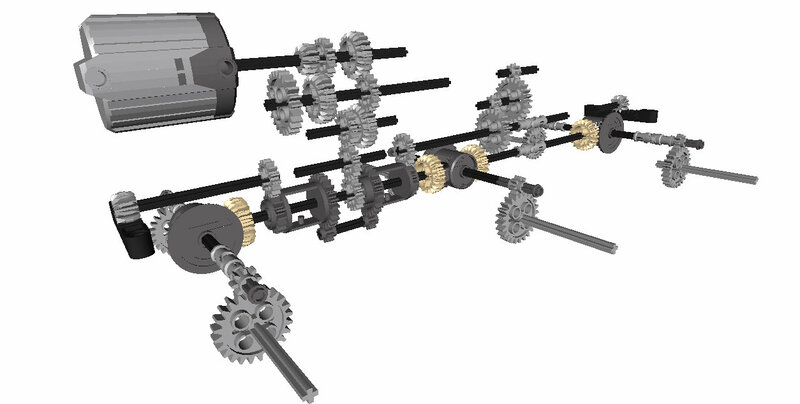 A pair of sliding 12 tooth double bevel gears slide back and forth one stud to connect only with the differential, or with both the differential and the neighboring gear locking out the differential. After toying with some old flex cable, and some pneumatics, I figured I was making it too complicated. I added a small pivot with a Small Technic Steering Arm, and connected it to a 9L link. 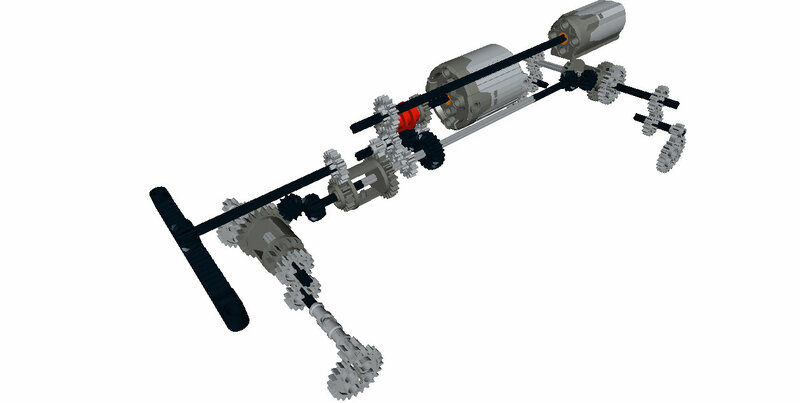 This way both axles could be connected, the suspension and lock could keep operating unaffected by each other, and it all could be controlled by a mini Linear Actuator. Initial tests were positive, so I then decided to figure out a body for the design. I worked for too long on a Daimler Scout body. I had the structure made, but the paneling was just not happening. After sitting on the project for 5 months, I decided it was time to make something new. The Bedford design worked well, and helped my get excited again in the project. Now, once I got outside to drive the truck a glaring problem occurred. The bevel connection in each axle that transmits the longitudinal drive forces to transversal drive forces kept slipping. You can hear it in the video. Because of this, it did not matter if it had locking differentials, or if it had a two speed gearbox, or if it had working suspension. Anything could stop it. 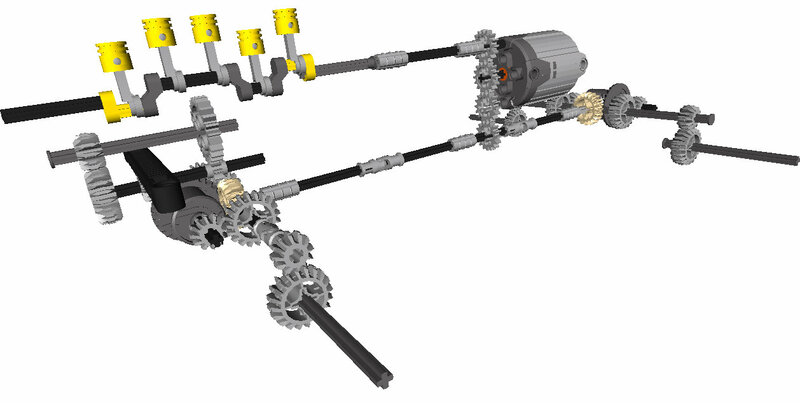 I though about reworking the axles, but then, I have been working on this for 11 months, it was time to be done. I’ll use the locking mechanism again. That worked great.